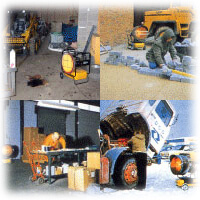 Cold weather brings with it a need for a portable heating source, especially in small warehouse spaces and on construction sites. Electric and gas infrared heaters are a great way to warm up a space with penetrating heat without having to worry about permanent heat installation. These infrared heaters can offer almost instant heat to help warm up any area that you choose. Electric infrared heaters heat up within just minutes to add heat, dry paint, and warm up machines and people. The great thing about electric and gas infrared heaters is that they reach peak efficiency within just a few minutes of turning on. This is a great help in making areas comfortable for working very quickly. The fact that the heater is infrared means that it will not lose heat to the air. This helps the infrared heater to work more efficiently than any other type of heater on the market. These electric and gas infrared heaters are very portable and easy to use, which makes them ideal for using on construction sites, because they can be moved from job to job. The added heat that comes from a unit can help to make working more comfortable, so that work can be done more efficiently. Ranging in weight from around 80 pounds to up to approximately 115 pounds without the fuel, the heaters are easy to load onto a truck to move them from place to place. Infrared heaters use diesel #1 or #2 fuel or kerosene and can work for up to 14 hours on one tank of fuel, depending upon the model of infrared heater that you choose. This way you can make it through an entire day of work or can warm up a warehouse for a longer period of time. Whether you need to dry paint, warm up a warehouse, or need personal heating, you will find that the electric and gas infrared heaters will do the job quickly and easily. These infrared heaters are odorless and they do not make a great deal of noise. These two benefits make these heaters ideal for using in small, enclosed spaces, such as warehouses and indoor construction areas. The electric and gas infrared heaters are a great choice for both indoors and outdoors to give you penetrating heat in the area that you need. No air is moved in using this heater either, which helps to keep the dust movement under control. This is ideal in construction areas because it helps to keep the working dust down, which will help the employees breathe easier and stay healthier. Electric and gas Infrared heaters are great for directing heat, due to their infrared heating design. This works much like sunlight, giving penetrating warmth to the area that it is placed and the people who come into contact with the heater. This radiant heat can make any room or area warmer within just minutes of turning it on. The infrared heating design gives heat to the room without losing it in the air, which makes it more efficient to keep you and your area warm and comfortable.